African taxis: friend or foe? South Africa doesn’t need roller coasters for thrills. It doesn’t need video games or ping ball machines. It has taxis. For just over three rand (about 40 cents) you get not only transportation but also an…experience. 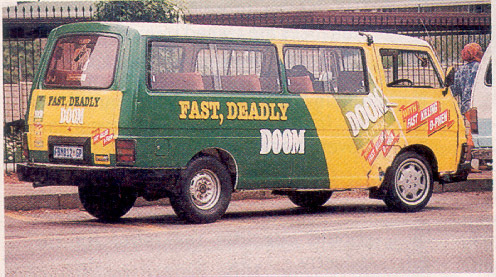 African taxis, oversized vans, are South Africa’s attempt at inexpensive public transportation. Although the cliental is almost exclusively black, here and there you’ll find a white face. Locals write them off as foreigners who don’t know better. To taxi drivers robots (traffic lights) and pedestrian crossings are merely suggestions to slow down. After all people have legs for a reason, right? It’s amazing how quickly even the most un-athletic looking person can transform into a track star when faced with a speeding taxi. Curbs and road lanes are simply irritations to be overcome. Traffic signs are colorful decorations in the scenery that flies by. You can tell a person who has just disembarked a taxi by the way he crosses himself and looks around with a new appreciation for being alive. Each taxi driver assumes the right of way at all times, even over other kumbi. In Johannesburg where traffic is thick and patience is thin taxi drivers will occasionally take highway patrol into their own hands. In what is dismissed by locals as “another taxi shootout” drivers will remind fellow taxis that tailgating and cutting off are not appreciated by calmly pulling up next to the offender and open firing at the front windshield. Riders make the payment for the trip by passing their rand to the person in front of them until it reaches the driver. They call out how many people the fare is meant to cover and the change is passed backwards, often traveling through as many as thirteen sets of hands. In a country plagued with some of the highest crime rates in the world, where people know better that to trust any stranger, especially with money, the code of the taxi dominates. Drivers never bother to turn around and count their passengers. They trust them to pay honestly. Customers likewise trust one another to see their money reach the front and their change return. It always does. Taxis, like South Africa, itself, are full of contradictions. They strike fear into unsuspecting pedestrians, yet, despite the many near, near, and very near encounters no one ever seems to get hit. On occasion they resort to violence, but inside they have a unique honor system. Some people say their cheap price isn’t worth the high blood pressure the ride mandates. But others, looking for a little thrill will say why not try it?